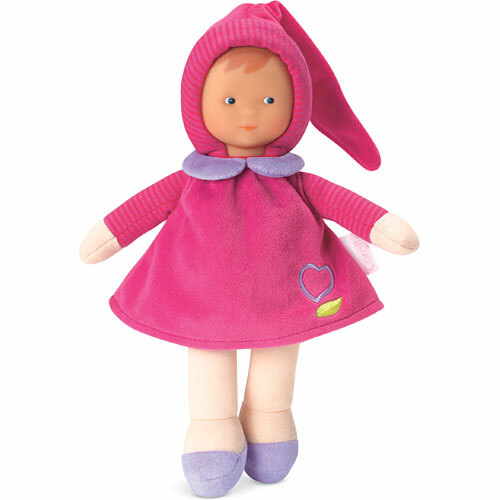 The ideal gift for ages birth and up, this delightful 9.5-inch first doll has a soft body that's perfect for hugging and cuddling! The sweet expression on her smooth vinyl face - delicately scented with vanilla, a Corolle signature - will charm and soothe little ones. A plus for parents: Miss Grenadine's Heart is machine washable (air dry naturally). A wonderful first doll for ages birth and up! Miss Grenadine's Heart is 9.5 inches tall so she's easy to take her along wherever baby goes. She has a soft, cuddly body that's easy for little fingers to grasp and hug. Her smooth vinyl face, delicately scented with vanilla -- a Corolle signature, has a sweet expression that will captivate the very young. Miss Grenadine's Heart will quickly become your little one's favorite play companion. Miss Grenadine's Heart wears a charming sewn-on outfit -- her raspberry colored dress has a lavender collar and a single embroidered heart just above the hemline. Completing her sewn-on ensemble are lavender "shoes" and a raspberry colored cap that frames her adorable face. 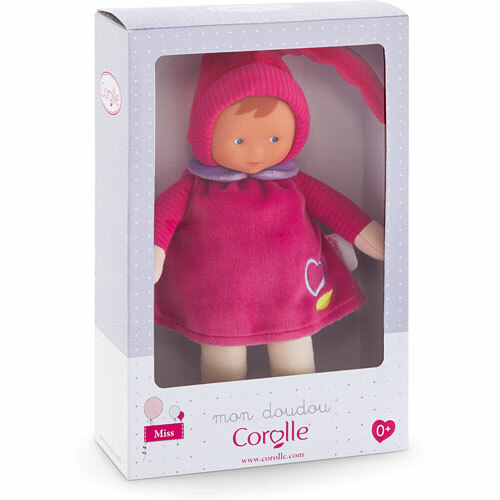 Like all first dolls in the Babi Corolle Collection, Miss Grenadine's Heart is machine washable (air dry naturally). Miss Grenadine's Heart is the winner of a Platinum Seal Award from The Oppenheim Toy Portfolio, the only independent consumer review of children's media. Award winners are selected based on their quality, innovation and ability to provide children with an engaging play experience. The Platinum Seal Award is The Oppenheim Toy Portfolio's highest honor. One 9.5-inch Corolle Babi Corolle Miss Grenadine's Heart Doll.